Supergirl: Season 3 still has the distinction of being the only female DC superhero series in their live action TV catalog that has her own series currently. Wonder Woman, arguably the most popular female character from all the comic book world is mysteriously missing and others appear in other series, such as DC’s Legends of Tomorrow or Arrow. I have never been a great fan of either Superman or Supergirl, but I was still happy to give the latter a look and was quickly disappointed to see them turn the series and its heroine into an angsty, unsure, relationship obsessed, insecure cliché of what a young woman should be. While much of those traits still remain in Season 3, they have thankfully been pushed a bit into the background, although Kara/Supergirl (Melissa Benoist) still finds herself in a star-crossed relationship with Mon-El (Chris Wood) this season. The big bad of season 3, however, and much of what the season fixates on, is the dark threat of fellow Kryptonian Samantha Arias (Odette Annable), who doesn’t realize she is a super-powerful being known as Reign who can destroy Supergirl and, well, reign over the Earth and the other aliens residing there. The season plays out much as one would expect with a few twists and some unforeseen events, most coming in a shift in relationships between Kara and some of her closest friends. These pose the most interesting developments going forward for this series. 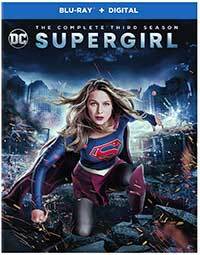 Supergirl: Season 3 arrives on Blu-ray in a solid AVC 1080p encodement from Warner. The series itself is bent toward a sort of low budget look that is just passable, so nothing ‘pops’, but it looks strong enough that it doesn’t seem too cheap. The colors are all natural and flesh tones look good. Shadows tend to look a bit noisy and there’s some occasional banding. Supergirl: Season 3 hits Blu-ray with an English DTS-HD Master Audio 5.1 audio mix that is a step above the quality of the streaming and broadcast sound, but that’s about it. These DC TV series, in fact, most of these Warner Bros. TV series have underwhelming sound design. There’s an abundance of diffuse ambience and sound effects that lack clarity. The low end is just okay, the midrange sound cluttered when things get loud, but they do provide clear dialogue and a decent amount of stereo imagery. This a disappointing slate of special features. The various deleted scenes may be the standout. The Comic-Con panel appears on other DC TV releases and everything else is typical fare. Inside the Crossover: Crisis on Earth-X (HD, 41:59) –The executive producers from hit DC shows Arrow, The Flash, Supergirl and DC’s Legends of Tomorrow engage in a spirited discussion about the fundamentals of a great story and bringing this monumental effort to the screen. She Will Reign! (HD, 08:23) – This featurette explores the journey of Samantha Arias, who is on a path leading to the discovery of her dark, Kryptonian roots, and her destiny to become the evil Reign. Supergirl: Season 3 improves slightly over its previous two seasons offering reason for it to continue and giving fans something to look forward to in a fourth season. The Blu-ray release reviewed here is satisfying though not perfect. Supergirl returns with its strongest season yet as the superhero battles a dark Kryptonian that could destroy her and conquer the world in Supergirl: The Complete Third Season, a satisfying if not perfect Blu-ray set.